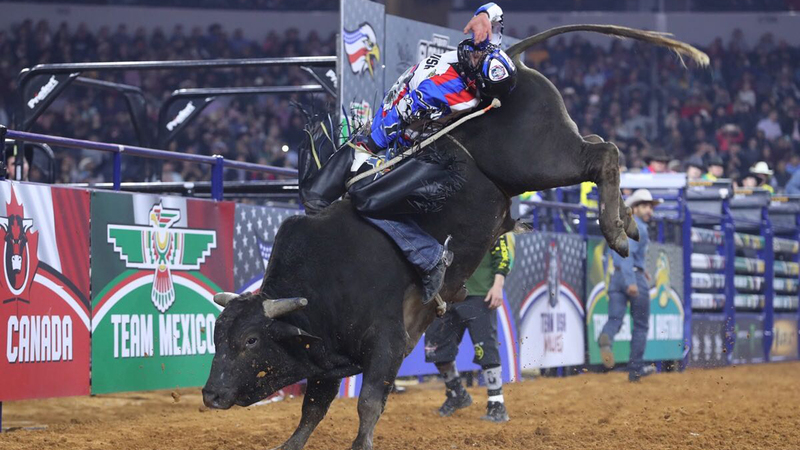 ARLINGTON, Texas – Cody Jesus has not had a fun week so far at the WinStar World Casino & Resort Global Cup USA, presented by Monster Energy. Jesus spent the majority of the week trying to sleep off a nasty case of the flu that has had him ravaged with a fever of over 100 degrees and unable to keep anything down. The 20-year-old had not felt so great since leaving Oklahoma City last weekend, but things got worse for him mid-week in Arlington, Texas. Instead of worrying about his potentially broken right ankle, Jesus spent the past three days drinking copious amounts of Pedialyte to try and get himself ready for this weekend’s international bull riding competition at AT&T Stadium. “I hardly get the flu, but when I get it, it usually hits me very hard,” Jesus said. “I didn’t have to go do a couple things and just rested up in bed, and that helped a lot and saved my energy for this deal. Regardless, Jesus was not going to let a lack of energy or that potentially broken ankle stop him from doing all he could for the Team USA Wolves. Jesus rode Kern River for 87 points in Round 1 as the Wolves finished 4-for-9 on the first night of competition for a third-place finish. Jesus was later bucked off by Fearless in 3.91 seconds in the Bonus Round. The Wolves trail event leader Team Brazil by 250.75 points. Fans can watch the conclusion of the Global Cup USA on RidePass Sunday at 1:30 p.m. ET. The Wolves spent the early portion of the event in the lead following back-to-back rides from Cannon Cravens and Ryan Dirteater. Cravens began the night with 87 points on M.A.G.A. The 18-year-old was excited for the matchup when his teammates let him choose which bull he wanted out of their pen during the Round 1 draft. Cravens has around 30 or so family and friends in attendance this weekend. He also had the honor of being the first rider to kick off the third Global Cup and he did not disappoint. Cravens bruised his right calf when he was bucked off by Hocus Pocus in 2.7 seconds during the Bonus Round. According to Dr. Tandy Freeman, Cravens is probable for Sunday. Dirteater took care of business against Boogie Bomb for 85.75 points in Round 1. The Wolves got one of the largest ovations of any of the teams competing this weekend. That energy is only giving them more confidence, Dirteater explained. “The Native American team, the Wolves, there are a lot of people here backing us, supporting us,” Dirteater said. “I know if we don’t get our job done, we’re not only letting us down, our teammates down, we’re letting the crowd down also. There was no question that Jesus is one of the most popular riders at the Global Cup too. The applause that he received during pre-event intros rivaled that of 2017 World Champion Jess Lockwood. Jesus got bashful about the comparison, but he couldn’t help but grin about the environment inside the home of the Dallas Cowboys.